Clay Shirky Says Good Collaboration is Structured Fighting – "Large collaborative projects aren't, in fact, large collaborative projects according to Shirky. They're small collaborative projects with tight groups, that integrate very large amounts of small participatory effort." Will it be orange? | Government Digital Service – Is orange a good colour for a government website? Does democracy have to be political? | The Democratic Society – "I can’t be the only one who has been struck by the way in which the people getting involved with the community clear-ups after the riots have been so keen to state that their motive is not political." Opening government, the Chicago way – O’Reilly Radar – "To get anywhere close to achieving that goal, Chicago will have to close the IT gap between the public and private sector, particularly in the emerging field of data science." The snow has made it a tricky week this week, with transport problems and the local school being closed. 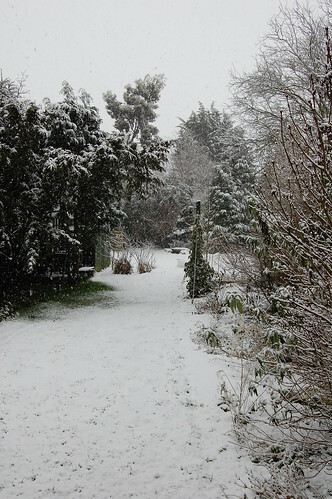 What’s more, just outside Cambridge, the snow is still falling on DavePress Towers. It’s hasn’t all been bad news, though. As Tom Watson reports, the confusion around the schools closures spurred DirectGov’s innovation dudes into swift action. Whilst the site is down right now for maintenence, this type of proof-of-concept prototyping is just what government needs to test what works and what doesn’t before project managers and the like get their claws into things. What’s really interesting is the way that Twitter is starting to be used effectively as a command line. People seem to have no problem typing data in conforming to a form of markup so that their contributions can be parsed and mashed up. Tom Watson reports via Twitter that MySociety’s FixMyStreet is now embedded in DirectGov. On the page in question, a boxout gives you the option of reporting a problem via FixMyStreet rather than through the usual route of DirectGov linking you through to your local authority. An interesting example of making volunteer effort a part of the ‘official’ government offering. I have had some interesting discussions with some local gov folk about how useful FixMyStreet actually is, so it will be fascinating to see how this is received.